Please be advised that our SWAC Processing Center will now be open on Monday's at LaGuardia Airport. Our Operations at LGA will now be Monday, Wednesday and Friday from 6:00 A.M. until 2:30 P.M. If you need any further information, please contact our Customer Service Department at 212-608-0855. Identity Trusted Resources. Manage Certified Compliance. Unknown workers, vendors, and even visitors pose a real threat to workplace security and safety. The Secure Worker Access Consortium (SWAC) is a unique cooperative program that delivers comprehensive personnel assurance technologies and services to risk managers of critical infrastructure, sensitive facilities, and places of public gathering. SWAC unites the efforts of public agencies, private corporations, labor groups, and contractors, assuring that all members comply with security and safety requirements. Real-time, need-to-know sharing of certified personal data validates members' trustworthiness, eliminates widespread duplication of effort, and continually protects members' privacy rights. SWAC Accepted Here. Join Now. A single incident can result in catastrophic human and economic loss. SWAC delivers a turnkey solution that 1000s of NY-region organizations have chosen to work together with the common goal of improving workplace security and safety. Joining is simple, and FREE for Public Agencies, Labor Groups, and Private Companies. Simply register your organization, and begin accepting SWAC certified members at your facilities.  And now, with new lower prices, it's easy to say "SWAC Accepted Here". SWAC has proudly served its members for more than 10 years. SWAC uses proprietary SAFETY-Act designated anti-terrorism technology. SWAC operates 7 processing centers throughout NY and NJ. SWAC is accepted by 7 NY-region transportation authorities. SWAC services over 45 Labor Unions and 3,500 companies. SWAC has screened more than 120,000 applicants. SWAC completes most background screens in less than 72 hours. All SWAC member data is encrypted, personal information multiple times. Click here to learn more about SWAC. Booth #209 - Come Visit us!